On the third day there was a wedding in Cana in Galilee, and the mother of Jesus was there... When the wine ran short Mary said to Him, "They have no wine." Jesus said to her, "Woman, how does your concern affect me? My hour has not yet come." His mother told the servers, "Do whatever He tells you." 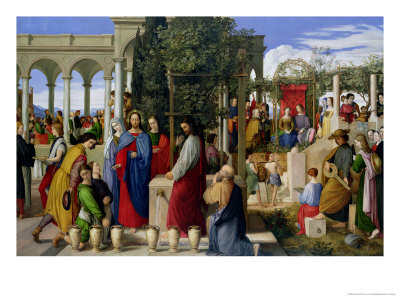 At the wedding feast of Cana Jesus merely told the servants to draw out the water and take it to the chief steward, He did not say a prayer over the water or touch it, He merely willed that it be changed from water to wine, Only God can create or change by an act of His Will alone. God's Prophets performed similar miracles, Elias prayed and the oil did not diminish until the famine was over, Here Jesus does not pray as one whose gift depends upon the Will of God. No-He is God-and His Will alone-creates or changes His creation. It was so when more than four thousand followed Him and forgot to eat for three days. As at the wedding feast of Cana, there was in the feeding of the multitude an important message, These kinds of miracles were performed by Jesus to impress upon the minds of the crowd that His power was the Power of God, These particular gestures of compassion were wrought as a symbol of something greater to come. Their hearts were prepared to accept a greater mystery that He would reveal before His death-the Mystery of the Eucharist, This Mystery was so great a gift from God that the human mind would never be able to accept such an influx of love without some preparation. He would one day change bread and wine into His own Body and Blood. The same Power would multiply; the same minister would distribute from the same Source of Love-Jesus.